Monovalent type 1 oral poliomyelitis vaccine I.P. The live, Monovalent Type 1 Oral Poliomyelitis vaccine (mOPV1), is a clear, transparent, yellowish orange or light pink coloured solution. It is a monovalent vaccine containing suspension of type 1 attenuated poliomyelitis virus (Sabin strain) propagated in primary monkey kidney cell cultures (P.M.K.C.C). 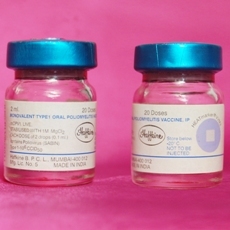 Each dose of 2 drops (0.1 ml) contains at least Poliovirus (Sabin) Type 1 - 106 CCID50 [The potency of the vaccine is expressed in the quantity of the virus suspension, that will infect 50% of cell Cultures]. The poliovirus is suspended in Hanks- Balanced Salt Solution with one Molar Magnesium chloride as a stabilizer and phenol red as a pH indicator. mOPV1 may contain trace amounts of Erythromycin and Kanamycin. The vaccine fulfils WHO requirements for Monovalent Type 1 Oral Poliomyelitis Vaccine. Monovalent Type1 Oral Poliomyelitis Vaccine is indicated for Poliomyelitis Supplementary Immunisation Activities (SIAs) in children from 0 to 5 years of age, to interrupt Type 1 poliovirus transmission in remaining polio endemic areas. The routine vaccination programme should continue to use trivalent vaccines according to national policy. mOPV1 must only be administered orally. Two drops are delivered directly into the mouth from the multi dose vial by dropper. For older children it may be preferred to avoid the possible bitter taste by first placing the drops on a sugar lump or in syrup. Care should be taken not to contaminate a multi dose dropper with saliva of the vaccinee. Overdose, if any, will not result in ill-effect. The vaccine vial monitor (VVM), if attached, has not reached the discard point (see figure). After first opening, immediate use is recommended. Monovalent Type 1 Oral Poliomyelitis vaccine (mOPV1)is administered to stimulate the body mechanism to produce active immunity by simulating the natural infection without producing untoward symptoms of the disease. This is achieved by multiplication of the vaccine virus in the intestinal tract. In the vast majority of cases there are no side effects reported with the trivalent OPV, that includes the same OPV1 component. Very rarely, there may be vaccine-associated paralysis (less than one case per one million doses administered). Persons in close contact with a recently vaccinated child may very rarely be at risk of vaccine – associated paralytic poliomyelitis. In case of diarrhoea or vomiting (including gastro-intestinal infection) the dose received will not be counted as part of the immunization schedule and it should be repeated after recovery.mOPV1 should not to be used for routine immunization. No adverse effects are produced by giving mOPV1 to a sick child. Individuals infected with human immunodeficiency virus (HIV), both asymptomatic and symptomatic, should be immunized with mOPV1 according to standard schedules. However, the vaccine is contraindicated in those with primary immune deficiency disease or suppressed immune response from medication, leukaemia, lymphoma or generalized malignancy. Vaccine is potent if stored at or below -20°C until the expiry date indicated on the vial i.e. for a period of two years from the date of manufacture. It can be stored for up to six months between +2°C and +8°C. Exposure of the vaccine to sunlight must be avoided.